There's plenty to be learned from outside of the design world. This is an updated article originally published in winter 2017. There are plenty of amazing design books around, but some of the best lessons can be learned from books that are about a different topic altogether. Last year, GV partner Daniel Burka put out a Tweet asking the hivemind which non-design books had taught them the most about their profession, and the thread proved hugely popular. Designers across the industry, from disciplines ranging from graphic designers to web pros and specialists in UX or UI design, got in on the discussion. We gathered some top designers' and design writers' picks, and asked them what their choice taught them. Most creatives suffer self-doubt at one point of another. The antidote, according to design journalist Jim McCauley, is Robin Ince's I'm a Joke and So Are You: A Comedian’s Take on What Makes Us Human. "If you've ever suffered from Imposter Syndrome or wondered what the secret of creativity may be, Robin Ince's book is a must-read," he says. "Written from the point of view of a comedian but applicable to most creatives, it's a warm, funny engaging look at all the tics and foibles that make us human." On the surface, you might not naturally link comic books and websites. But Scott McCloud's Understanding Comics: The Invisible Art has a lot to teach web designers, argues digital product designer Cennydd Bowles. "Scott McCloud wasn't writing for designers, of course, but it turns out that understanding sequential art is spookily similar to understanding sequential interfaces," he says. "It's rich with Gestalt theory and the sort of taxonomic thinking that information architects love." Warren Berger's A More Beautiful Question: The Power of Inquiry to Spark Breakthrough Ideas is an in-depth exploration of the art of questioning things – something creative director Miika Puputti thinks is core to the design process. "How we question briefs and solutions, and the truths we face, is a crucial part of design. The ability to ask 'why' is important in our lives as designers, and the book explores why children, for example, are more skilled in questioning and how we lose this skill over time," says Puputti. "It also explores techniques to help you hone the skill of asking 'why' and 'how' and 'what if' – all questions that are needed in any creative work." Malcolm Gladwell's Blink: The Power of Thinking Without Thinking is all about the power of first impressions. "This pop psychology book shows how the fast judgements we make every day may be more important than we think," says Creative Bloq's own Rosie Hilder. "It makes you realise how first impressions and outward appearances really do matter, and there’s plenty of studies you can quote in there if your client doesn’t believe you." Experimental designer Brendan Dawes tends to avoid buying the obvious design books. "I think it’s more important to look outside your own field of expertise," he explains. "That’s much more interesting to me." Dawes picked Charles H Bernstein's Film Music and Everything Else, which he first came across in a tiny bookshop in Ojai, California. It piqued his interest as a fan of film music, but it ended up being relevant to his work as a designer. "This book is almost like a mini philosophy manual, talking about creativity in its widest possible sense, helping you look at the world in a different way, which you can then apply in a myriad of ways in your work no matter what that might be," he says. "For me, interaction design is about rhythm and composition as much as film music is." Stewart Brand's book on what happens after buildings are built was the book that kicked off the whole thread. It proved popular with respondents, including digital consultant and UX designer Andy Parker. "Reading How Buildings Learn is a critical reminder of all the design practices we desperately want to move away from: exhaustive planning, big design up-front, not working with customers, and allowing rockstar egotism to influence direction," he says. "It's a powerful reminder of how costly these methods of design can be." The book is also an important reminder of the effects of designing based purely on aesthetics. "The greatest insight is in how people change the space you design to suit the way they live – not the way you envisaged it. They knock down partitions, repurpose rooms, and relocate entire structures for the house to flow how they want it to," he continues. "There is so much we can learn from architecture and remind ourselves how fortunate we are that what we write today is dead tomorrow and replaceable for free." The book was turned into a TV show on the BBC, which you can now watch on YouTube. David Macaulay gained fame for explaining how things work via charming illustrations, including architectural picture books examining cathedrals, castles, pyramids and more. Product designer Hannah Donovan picked these as her favourite books about design that's aren't design books. "They not only show the process of making something (in this case constructing a building), but they also present this process in a beautiful way where the reader cannot help but love the processes as much as the product," she comments. Designer and information architect Doug Somerville picked national best-seller Flow by Mihaly Csíkszentmihályi, which studies the psychology of happiness. "Flow was a great introduction to some the psychology behind cognition, concentration, feedback and motivation," he says. "The ‘state of flow’ (and understanding it or being able to create the conditions for it) presented in the book has so many parallels to interaction design, service design, information architecture, game design and lots of other fields." Thinking, Fast and Slow is an international bestseller, penned by Nobel Prize-winning psychologist Daniel Kahneman. And it has plenty to teach designers. "Daniel Kahneman's book reveals how the brain has two speed settings – fast, intuitive thinking, and slow, rational thinking – and explains how you can train yourself to think slower and make better decisions rather than tripping yourself up with the errors and prejudices that emerge from faster thinking," says design writer Jim McCauley. Published in 2010, Different: Escaping the Competitive Herd by Youngme Moon explores how going against the grain – rather than tirelessly competing to be the best at the same things – is the ticket to success. The book had a big impact on product manager and UX designer Clint Gardiner. As well as teaching him to ignore the competition, it also reinforced that innovation can happen through the removal of benefits and functionality. "Not everything that is important can be measured," he explains. "Data and research are only one piece of the puzzle, and never tell us the full story. We need to be careful what conclusions we draw." To see Gardiner's notes on the book, look here. Most designers spend their days crafting things for people to use, so it makes sense that understanding human behaviour would improve your design skills. UX designer Shane Guymon picked The Power of Habit as his top design book that's not about design. "This book does a really good job of providing an understanding for why we do what we do as humans. It helps understand how habits are formed and how to influence habits," he says. "The dangerous aspect of this book is that this understanding can also be used to manipulate people into forming habits that you want them to have, but that they don't inherently want." A few years ago, Andy Budd invited Pixar's Michael B Johnson to UX London to share some insights into the process of making movies. "At the time I remember people thinking it was a strange choice. After all, what could UX designers learn from a film company?" he recalls. "Once the talk was over, the answer became clear. Irrespective of the medium, Pixar has built a culture designed around creativity, along with a process that is more akin to a tech startup than a traditional movie studio." 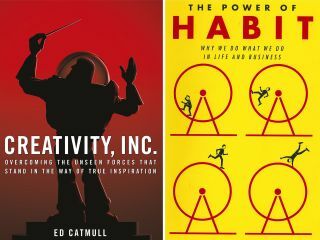 Creativity Inc by Ed Catmull – the current president of Pixar and Walt Disney Animation Studios – takes a deep-dive into the company's creative process and culture. "While the medium is vastly different, the leadership lessons Catmull shares are as relevant to our industry as any book on lean product management of digital leadership," continues Budd. "In fact, you could argue that Pixar is the original Silicon Valley tech startup." Digital product designer Cennydd Bowles also opted for Donella H Meadows' Thinking in Systems, a primer on the methodology of systems-based thinking. "Advanced design is largely systems design. "For me, this book was a one-way valve to a new way of seeing," he enthuses. "You learn where interventions can actually make a difference, and where they will be wasted. You start to see the whole world as a network of systems, and roll your eyes at the doomed mistakes you see repeated all around you." John Maeda is a professor in MIT's media lab, and this is his second appearance on this list. Maeda's 2006 book The Laws of Simplicity examines how to make things simple without stopping them being useful, and is super-useful for designers of all kinds. It's Doug Somerville's "go-to non-design book for unblocking tricky design problems". "Simplicity is a goal (or principle) for most designers, and Maeda’s book is a concise and precise study on how to achieve it," he says. "Even the structure of it is beautifully simple. It’s an enjoyable quick read and a valuable reference book to keep coming back to for ideas and quotes."